Recently, while perusing the archives of the American Shakespeare Festival Theatre in Stratford, CT—where Saxon Mills is based—I came across something interesting. 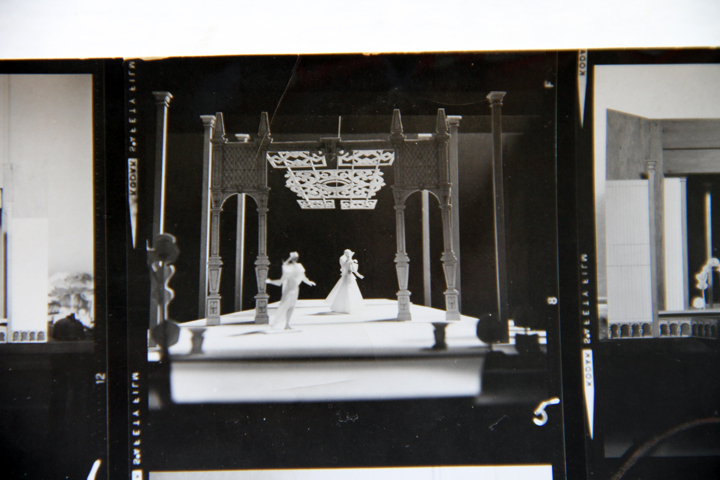 It was a contact sheet for a set of photographs of a model of a set, which was to be built on this hallowed stage in the mid-1950’s. I quickly saw the corollary between these giant stage productions and the productions of webseries, music videos, and other intentional online video content. 3D modeling of sets is clearly nothing new. What is exciting is how accessible they are for the cost-conscious producer of online video, today. Google Sketchup from "Good Night and Good Luck"
The 2005 film, Good Night and Good Luck, directed by George Clooney utilized Google Sketchup. In 2006, production designer James Bissell was quote as saying, “I’ve used SketchUp to design movie sets for almost two years and I love the ease with which I can add to an existing design. 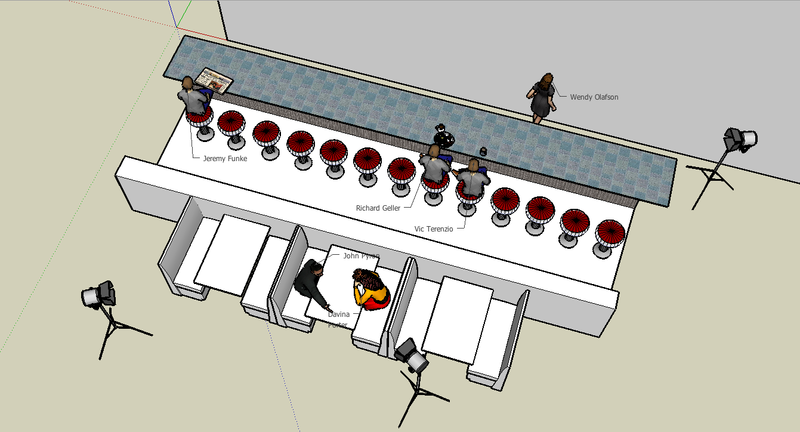 Making quick edits is crucial to the movie production process and this software delivers on its promise of ease and accessibility.” The ease and accessibility is exactly why Google Sketchup is such a powerful tool in the creation of online video. There are so many different reasons and ways to make the most of 3D modeling for production. However, this post is focused on how our team has reduced time on location by utilizing this free tool. Twice I have had access to my ideal location with very limited time to set, shoot, and strike. In both cases we beat the allotted time by 15 minutes only because we had spent considerable time on location virtually in Google Sketchup. 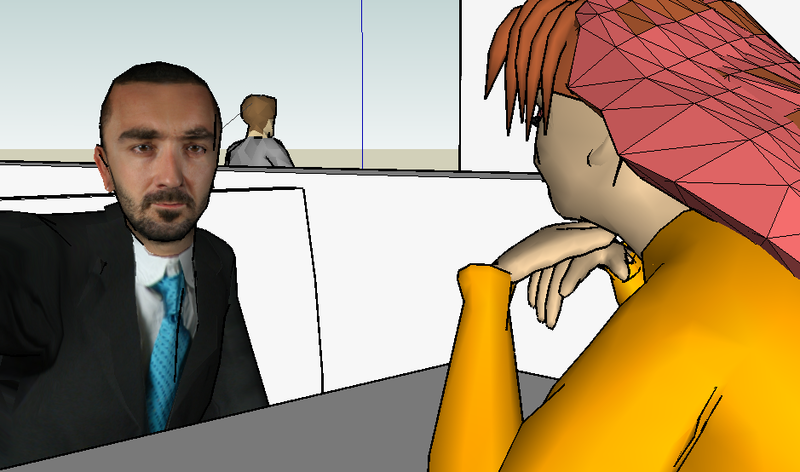 Google Sketchup comes with an expansive library of models to pull into the virtual location, including Arri and Kino Flo lights & stands as well as models of architectural elements such as Pella windows and models of people in various shapes, sizes, and colors. process was used when the team had one day to shoot twenty-two pages of script in the Hersham Acorn Newspapers offices for The Oligarch Duplicity. Knowing that we didn’t want to move lights during the shoot, we were able to load in pre-existing models of the lights we planned to use and office furniture as well as models of people. We created an entire storyboard of shots with the lights in place. Though the team spent less than eighteen hours to set, shoot, and strike the newspaper office, it was only possible because we had spent more than eighty hours on location virtually. There are many reasons to create 3D models prior to production. This is something they knew at the American Shakespeare Festival Theatre more than fifty years ago; back when the slide-rule was the tool of quick calculations. Now today, when productions are viewed around the world simultaneously from small and large production companies alike; it’s great that such a powerful tool is available to take advantage of the latest technology to do the same thing. What should be exciting for the online video industry is that budget or lack of it is not a barrier to use. 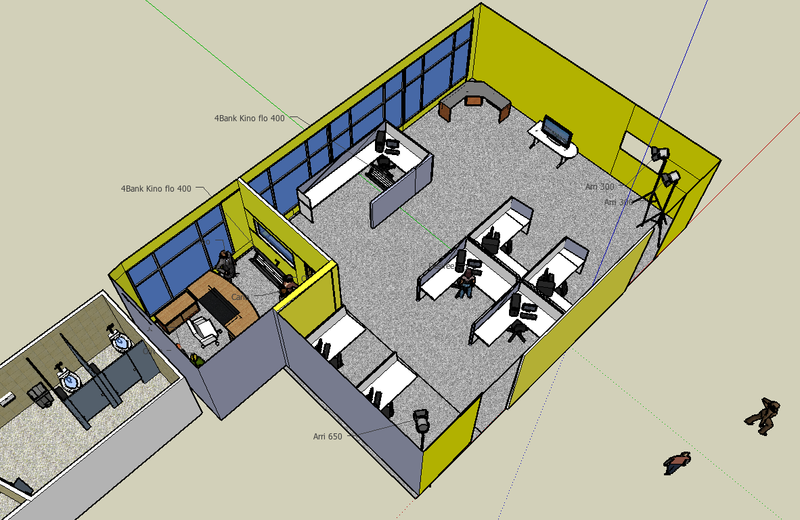 You can find Google Sketchup here: http://sketchup.google.com/. Most segments of industry were hit hard last year! Remember just a month ago when we were all kissing 2009 goodbye ready to see it gone forever? Well Jeremy Allaire‘s company, Brightcove, managed to grow its revenues 50% year over year, in 2009. Their customers have ranged from media companies (The New York Times, Fox, AOL, etc.) to plenty of non-media companies (Reebok, GM, Ticketmaster, etc.). And, seeing an opportunity to develop customers on the lower tier of online media, they rolled out Brightcove Express for $99/month; perfect for your local newspaper just dabbling with online video or that travel company looking to grow its community of travelers! Jeremy Allaire is no new-comer to this space, either. Having co-founded Allaire Corporation where he developed Coldfusion and then teamed up with Macromedia to develop Flash, he is truly one of the online video industry’s leaders. Rocket’s Tail caught up with Jeremy Allaire at the Brightcove Headquarters in Cambridge, MA to talk with him a little bit about where the industry is right now, where it might be heading, and how that intersects with other industry segments. Dina Kaplan has a number of shows that she really enjoys and they are all on a network that she co-founded with Mike Hudack, Justin Day, Charles Hope, and Jared Klett. 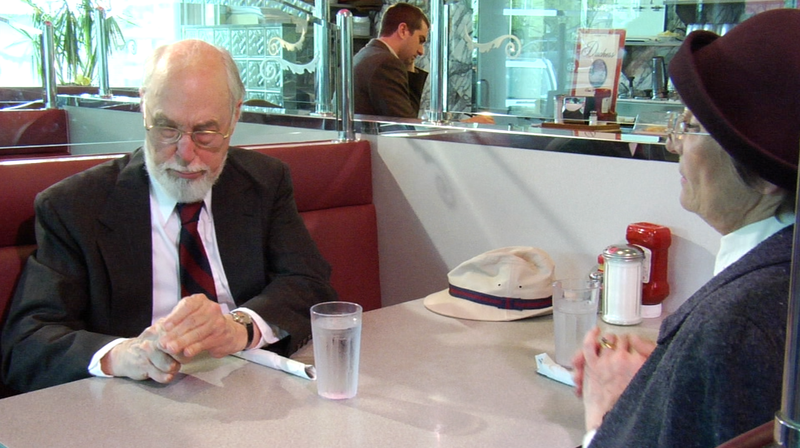 They are on the ground floor of a critical evolution in syndicated content; online video. Boasting some fifty thousand shows currently and constantly adding more, Blip.tv recently added syndication to a wide variety of aggregation portals like: iTunes, YouTube, Roku, Tivo, and many more. Where Hulu aims to purvey the highest quality content from the top-tier studios and networks and YouTube is targeted at “every-user”, Blip.tv aims to develop the middle tier of webseries productions and syndicated them (with advertising) to a wide range of portals. Rocket’s Tail recently caught up with Dina to hear her thoughts on what differentiates them in the market place, the coming evolution of 3D, and the future of online video. Thank you James Cameron for helping the world see that, yes, 3D is pretty darn cool; even with cheap versions of the goggles. I may be ready for my cool Ray-Ban styled 3D glasses; but the rest of the world is just now getting a handle on this fact, “What?! I can watch football live in 3D?!!! !” And happily as CES, the worlds largest consumer electronics show, gets fully underway this week in Las Vegas; we will be treated to a bevy of articles about the coming 3D revolution (at least that’s what broadcasters are hoping!). This morning the New York Times jumped with both feet with this article: Television Begins a Push Into the 3rd Dimension. If you found it here, pass it on and send people back! Thanks. Get Ready for 3D to Kick You in the Face! Yeah, you heard it right…kicked in the FACE! I recently sat in the screening room at 3ality (said: three-ality) Digital in Burbank, California. A camera swept across the stadium toward Bono and the Edge in a clip from the U23D concert movie, and I brought my fingers to the side of my neck to check my heart, which was pounding! Quick cut to a kickoff in last year’s Super Bowl in 3D. I’m not talking about a layer of one team, a layer of another team, and then everything else. I’m talking about a real three-dimensional image; smooth 3D from the closest player to the very back of the stadium, the way my eyes naturally see it. Absolutely amazing! And still, most of the population is perplexed by all the 3D talk. Over the past year the press has done little to clear up why some people are talking so much about 3D television. The same questions always come up: Do I really need to buy yet another TV to get 3D? Can’t I watch 3D on my current TV? Do I have to wear those funny glasses? The immediate answer to these questions is always “Yes,” and then the writer goes into tech speak and my eyes roll back into my head as I start thinking about something on another website and click away from the article. After watching the sample in the screening room, we walked into the lobby, where we watched clips from popular television shows in 3D. Again, the images were incredible. So what’s the big deal? Why can’t I have my 3D TV now? Well, you can…sort of. Get ready for the rich-nerdy-tech-girl down the street to have the coolest, newest TV technology before you do. But it won’t be long before you can have it too! Acer is coming out with a cool new laptop pimped out with a 3D monitor that’ll run somewhere in the neighborhood of $800. But the real test will be next year when FIFA and Sony team up to produce 25 live sporting events in 3D. What I’ve heard is that the events will feature Manchester United, that 3D monitors will be placed in pubs throughout England, and that 3D glasses will be given out with beverages (gives a whole new meaning beer goggling!). So here’s the key for me: blow-your-mind-incredible production values. What made those images of the Super Bowl and the U2 concert and even the nature images in the 3ality Digital screening room so compelling? They were well produced. When I was watching them, I wasn’t thinking, “What great 3D images.” I was thinking, “Wow, what an incredible experience!” The impression was so mind-bending because it wasn’t just about the 3D images, it was about being engaged with and immersed in the content. It would be pure joy to be in a pub in England with a group of happy (um, drunk) fans when that first ball comes flying out of the television at them. Now that’s just good clean fun! Fortunately, James Cameron and Steven Spielberg are leading the charge with 3D films. We can hope that equal heavyweights lead the charge in television. When I left 3ality Digital that afternoon, those images kept coming back to me. The experience was unforgettable! Not only do I want to own the latest and greatest technology to view this incredible new content, I want to start shooting in 3D…now! So, yes, you will need glasses, but the latest versions look more like Raybans. And, Yes, you’ll need a new TV, because, NO!, your current TV absolutely will not play 3D like this. Once you see 3D this way, you won’t want to go back.